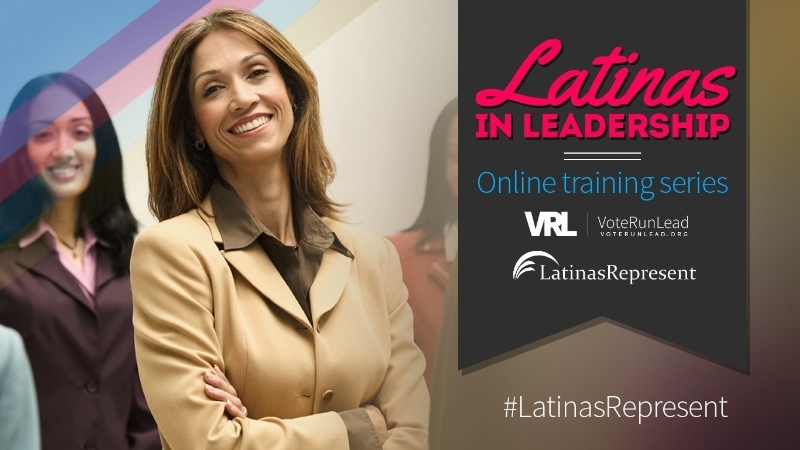 VoteRunLead has teamed up with LatinasRepresent to launch the 2015 online series calling all Latinas to political life. Latinas in Leadership online series encourages Latinas to step into their political power, get involved in local and national politics, and learn the skills necessary to run for public office. Last year, LatinasRepresent released a report shining a spotlight on the abysmal number of Latinas in public office: of the country’s more than 8,000 seats in state and national political office, only 109 are held by Latinas. “To create a more effective and reflective democracy, we must work to actively advance Latina representation from our communities to Congress,” says Political Parity’s Nadia Farjood. Political Parity commissioned the research and has partnered with the National Hispanic Leadership Agenda to mobilize Latinas nationwide through LatinasRepresent, both in-person and online at www.latinasrepresent.org. This five-part online series will include webinars focused on the mobilizing your networks, skills training and declaring your personal ambition, and includes conversations with today’s leading Latinas. The one-hour online clinics began on March 26, and include a live session at VoteRunLead’s National Go Lead conference in St. Louis, May 8 & 9. This series is open to everyone. Webinars are free and held on Thursdays at 2 p.m. EST. Individuals can register today at www.VoteRunLead.org. The first step in stepping up is speaking out. Telling your friends and family about your ambitions or sharing your goals with peer and colleagues is a powerful tool to help you achieve your leadership potential. Hear from Colorado State Representative and Majority Leader Crisanta Duran, and find out how she realized her dream, became a powerful elected official and national role model. The power of our networks make running for office more doable. You don’t have to figure out the rules or navigate the politics all on your own. This session will help you identify key players in the community, make the most of mentoring relationship and tap the right people in your networks (or grow them) to pursue your ambitions. Support is all around you. Let’s find it. This session will help you turn your social and professional networks into the support team you need as you run for office – whether it’s a friend to babysit and colleague to help with the budget or your family as key volunteers. You will be surprised by the support and talent already available to you in your networks. Sometimes you just have to tell it like it is. Hear from elected officials and women who’ve done it about how they tackled tough conversations with colleagues, created trust with new donors, or called out racism and sexism as they climbed the leadership ladder. National Go Lead will focus on the full range of civic leadership opportunities from voting rights and reforms to women’s leadership in civic life. Get inspired to ramp up your leadership and walk away with new skills and networks to help you get where you are going! Latina leaders are encouraged to attend this in-person training in St. Louis, MO for a special Latinas in Leadership live session. Register today at https://voterunlead.org/national-go-lead/. The small number of Latinas has not stopped a powerful group from having a big impact on their communities, Congress and constituents. Aimed at current elected officials or community leaders who are ready for more, this session will walk you through the difference between campaigning and governing and how to serve one position well, while you seek another. VoteRunLead is strengthening democracy by unleashing the power of women leaders through training, technology and community. VRL is the only online platform for women to learn to vote, run and lead.